Naturalist Naomi Cobb and Lynden Graduate Fellow Anna Grosch introduce Lynden's new Discovery Kits, designed to provide visitors with lively, hands-on ways to engage with art and nature when they visit Lynden. 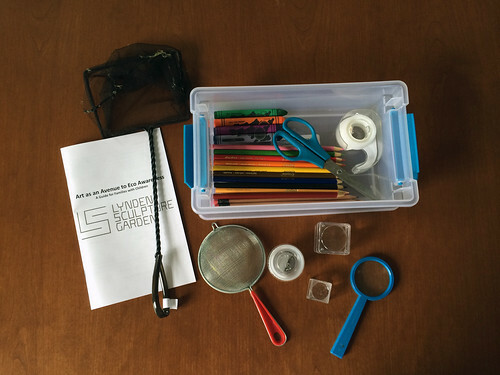 The kits are available for checkout from the front desk, and each contains a booklet filled with activities and supplies ranging from pencils and crayons to magnifying glasses, bug boxes and strainers for catching critters in the pond. Naomi and Anna will demonstrate ways to get the most out of your Discovery Kit, and will introduce you to some of the other equipment--butterfly and pond nets, specimen containers, drawing boards, plein air painting boxes--available for checkout.